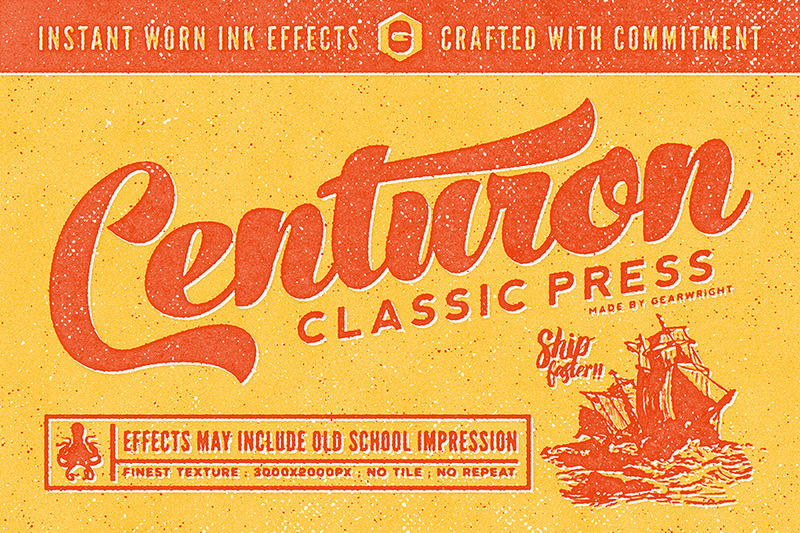 Introducing Centuron Press: A gritty smart press that transforms your work into weathered pieces that an aged impressionist gramps would love looking at. 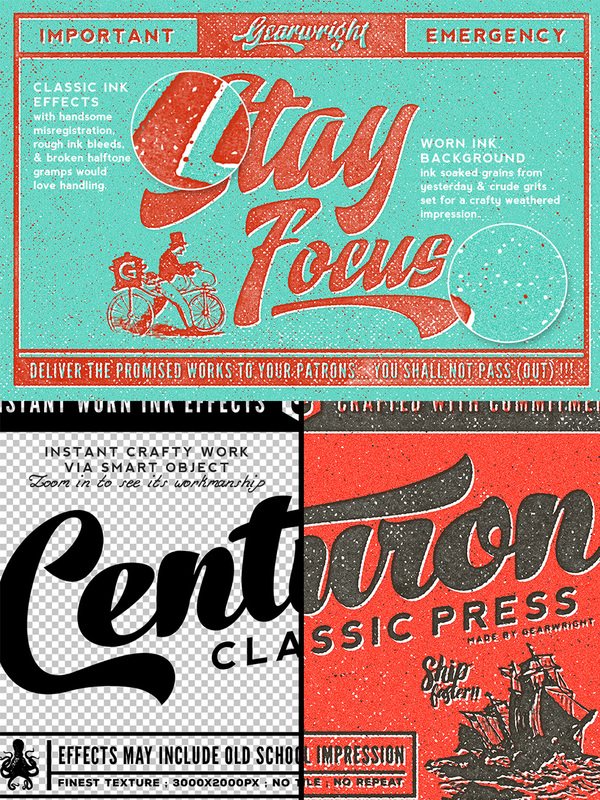 With dozens of carefully crafted halftone and old school effects passionately made, Centuron Press will hustle your design workflow and bring awesomeness to your projects at speed! • Centuron Press .PSD (3000x2000px 300PPI): The .PSD which brings delicate texture & yesterday to your design, just as advertised in previews. Drop your design inside Smart Object and save, Centuron will finish them with rusty inked plate and handsome halftone instantly. • More than 30 handcrafted textures (3000x2000px 300PPI) in total for your customization purpose. Options & possibilities are friends to designer. 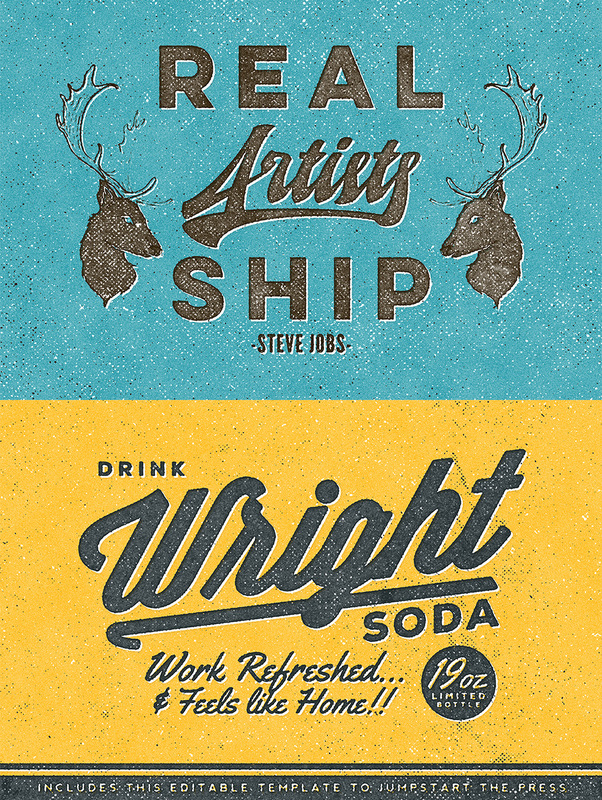 The texture includes halftone (20+), grunge (9), ink and etc. Readily set in the press, activated with a click. • Grainy inked background textures are made part of Centuron Press. You can customize them easily to achieve desired result easily! • An editable template to help you jumpstart the press in seconds. All fonts (free) information are included in Read Me Notes .PDF. • My texture are organic and authentic; they are of high quality, do not tile and never repeat & always freshly made! I never duplicate or adapt texture from/ to another products. You can sit back and relax when you buy from us. File size is approx 634.7MB (938.2MB unzipped), offered as a single download.